So what does one include in an airborne list? In my experience, forces of this nature operate better with small model counts. 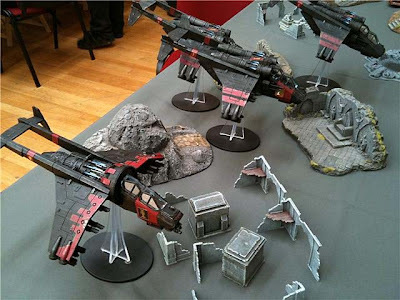 Valkyries are big models and maneuvering more than 5 or 6 flying bases can be incredibly difficult. The airborne player spends much of his time dancing out of range of the enemy's heavy weapons meaning all of you army will be force into one corner of the table. In addition, airborne forces only get one chance to break the enemy's back before their light armor and flimsy cover saves fail them. Thus the airborne player must equip their squads to deal with their targets decisively in order to avoid retaliatory fire and assaults. This in turn means many points will go into small, elite units capable of multi-tasking and dealing with a variety of targets. Veterans are far better suited to the airborne role than platoon squads due to their increased efficiency. Carapace armor makes bolters less lethal, demolitions allow you to make critical hits against Terminator and Power-armored targets. Plasma pistols on sergeants help inflict that critical last wound on monstrus creatures that would like nothing more than to shred your squad in close combat next turn. Straken is an excellent inclusion in an airborne army. The combination of command squads bonuses (special weapons, reserve bonuses, orders) and close combat capability make a Straken -led close combat squad an ideal beginning to an airborne list. Furious Charge is a good crutch for an army that has one chance to deal its damage to the foe, suffering as the Imperial Guard does from lack-luster initiative and strength stats. The problem, however, with expensive units such as the fully loaded close combat squad and Veteran squads is their dependence on the critical units that carry them. When the opponent targets your Command Squad, he's also targeting the Valkyrie or Vendetta their riding in. A successful hit may well cripple two units rather than just one. Most often the airborne player will take three Vendettas to fill his Fast Attack slots. This is because of the undeniable role of these death-dealing flyers to visit destruction on the enemy's armor. Vendettas give you the ability to challenge your opponent to a stand-off, trading shots and relying on your firepower to see you through. It also helps you pick off choice targets at a distance delaying their progress and buying your objective keepers precious time. Vendettas also allow your objective keepers to play an active role punishing the enemy from afar while hovering near key locations on the table. I don't think it needs to be said, but in case it wasn't clear, you should never, under any circumstances, trade in your lascannons for missiles. Many claim that buying heavy bolters for your Vendettas lends them versatility and for 10 points you may as well. I will say that I've never used them and have never missed them - BS 3 simply isn't that impressive. Valkyries are excellent units even eclipsed, as they are, by the formidable Vendetta. Equipped with a multilaser and multiple rocket pods, they can harass the foe whilst still retaining their speed. The added templates are invaluable when dealing with Gaunts, Ork Boyz and Eldar on foot. They are better offensive transports than Vendettas, the latter requiring a relatively stationary position to make the best of its weapons. The Valkyrie chassis also makes for an imposing model in the physical sense. It's ability to deploy anywhere and engage any target can wreak havoc on your opponent's nerves giving you an incalculable but significant advantage. Placing the Valkyries in reserve to outflank can maximize this effect especially when opponents are unfamiliar with facing this tactic on a large scale. The 'Scouts' special rule is perhaps the most potent weapon in the airborne arsenal. A clumsy opponent will place his units as close as possible to yours during deployment allowing you to scout move within 12 inches of him and assault critical targets first turn. Meltabombs, priests with eviscerators and Straken will serve you very well in this endeavor. Oftentimes you will be able to neutralize all of your opponent's anti-tank weaponry in this opening strike giving your transports full reign over the table. It's worth mentioning that even if you do not get first turn, scouting everything forward may still be a viable tactic as the opponent is not likely to be able to deal with all your transports (and their cover saves) in one turn of shooting. In most cases, however, reserving everything is the best option available to airborne players who are going second. Another rule useful to first turn chicanery is the Grav Chute Insertion rule allowing you to disembark melta-toting models as much as 24" away from their starting positions. This is, however, more of a scare tactic than anything else; it would be a desperate situation indeed in which an IG player would risk the contempt of the dice gods with such a move. In the 80 or so games played with my airborne troops, I've used this special rule perhaps three or four times. • Avoid trading units if at all possible. It's ok if Veterans must die to blow up a Land Raider but a Rhino is seldom worth it. • Use your cover saves to get into key positions. Example: A Valkyrie full of Demolition Vets zooms 24 inches to stop next to a squadron of Russes. The enemy must inflict half a dozen penetrating hits to have a solid chance of felling the Valkyrie. The next turn Veterans can disembark, forgo any shooting and proceed to charge multiple vehicles with their meltabombs. • Don't be afraid to take the fight to the enemy. Your small model count will mean everyone that can fight, must fight. More often than not I will relinquish my own objectives and assault the enemy full on, capturing his. Remember to augment your force with some close combat potential for this purpose. • Deep striking units work well with airborne forces. Marbo and the Callidus assassin make frequent appearances in my lists. They add to the feeling of helplessness your opponent is likely to endure when facing you because there is seldom a good defense against such units. A painted airborne force plays better than an unpainted one. Valkyries can have a psychological effect when fielded en mass and a coordinated paint scheme will help make the most of this effect. Remember that opponents will fear your army because it's unfamiliar - use this to your advantage. I hope this guide has been helpful. I don't consider myself to be an overly competitive player overcome as I often am to play with rules that don't appear in any rule book. If you'd like to chat contact me at rulesmanufactorum@gmail.com or stop by Rules Manufactorum. You say "opponents will fear your army because it's unfamiliar" as if a bunch of Valkyries and Storm Troopers aren't the number one bullcrap crutch that all the new Guard players are using. Seriously, have a look around the internet, it's becoming rare to find an army that DOESN'T rely entirely on this junk. It's cheap, and it's very easy to buy a few dozen Pig Iron futurenazis and pretend they're USMC or "Wehrmacht". Did I miss a suggestion for the HQ slot. This is the first army idea that has drawn my attention to the IG codex. Vendetta- gunship that happens to have a transport capacity. Valkyrie- transport plane that happens to have offensive capabilities. I like to pair my meltas with a Valkyrie so they can get into close range, and flamers with my Vendetta so that it has an anti-horde option/distraction unit. I liked this article, good work. It's strange, as I just posted an AirDav list on my own blog - but coincidences like this amuse me. Doh! Clearly, I meant AirCav. With a 'C'. Thanks, great advice. I've just started up my Elysian Drop Troops army and your tips will definately come in handy once they take the field!